The interest offering on 5-year senior citizen savings scheme will be 8.7 per cent as against 8.3 per cent for the quarter ending September 2018.
increase in deposit rate offerings by banks, the Centre Thursday announced up to 40-basis point hike in interest rate of small savings schemes for the third quarter i.e October-December 2018. With the first hike in 30 months, in the interest offering on small savings schemes, the public provident fund (PPF) will now earn 8 per cent w.e.f from October 1 as against 7.6 per cent in the July-September quarter. The interest offering on the 5-year senior citizen savings scheme will be 8.7 per cent as against 8.3 per cent for the quarter ending September. The flagship Sukanya Samriddhi Yojana will earn an interest rate of 8.5 per cent in the next quarter. The 5-year national savings certificate (NSC) will earn 8 per cent now and the 5-year time deposit will earn 7.8 per cent. The hike in rates of small savings will also increase their attractiveness over bank deposits significantly. Currently a 5-year term deposit with the State Bank of India earns 6.85 per cent. In February 2016, the government had announced a cut in interest rates on schemes such as Kisan Vikas Patra and recurring deposits by up to 25 per cent. It also announced its decision to revise the interest rates on small savings schemes on a quarterly basis beginning April 1, 2016 as it decided to align interest rates on several small saving schemes with government securities (to be recalibrated on a quarterly basis). Since March 2016, the interest offering on small savings schemes witnessed a sharp correction. 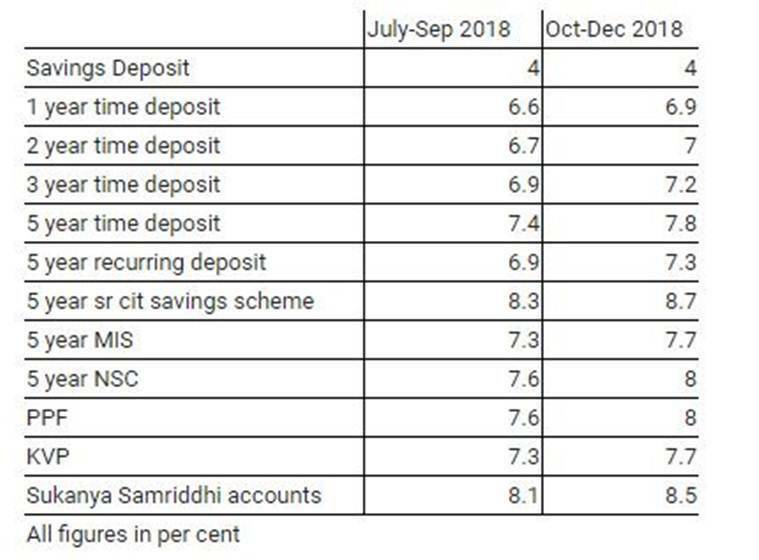 While the interest rates on the 1-5-year term deposits stood at 8.4 per cent in March 2016, it fell to 6.6 per cent for the 1-year time deposit and 7.4 per cent for a 5-year time deposit. For NSC, the interest offering came down from 8.5 per cent to 7.6 per cent in the same period, whereas for Kisan Vikas Patra, it declined from 8.7 per cent to 7.3 per cent. The interest rates on PPF too fell from 8.7 per cent in March 2016 to 7.6 per cent now. A hike in interest rate for the Oct-Dec quarter may not only earn higher interest income for the depositors but will also help resurrect the fall in fresh receipts in small savings schemes. 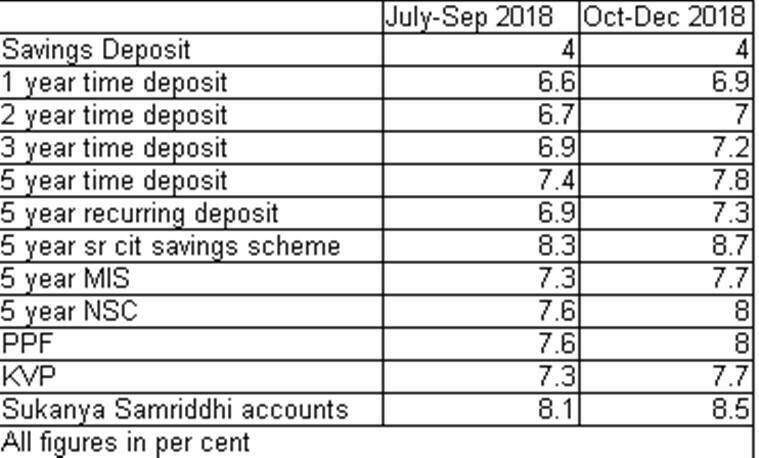 RBI data shows that there has been a sharp decline in monthly receipts in the small savings schemes in line with the decline in interest offering on these schemes and growing attractiveness of mutual funds. In the 11-month period of the last financial year Apr 2017-Feb 2018, the total receipts within small savings schemes amounted to only Rs 60,915 crore. However, in the corresponding period of the previous year, the receipt within these schemes was more than six times at Rs 3,86,145 crore. The decline in receipts has been across all instruments including the PPF. In the 11-month period between April 2017 and February 2018, the total receipts in PPF stood at Rs 2,910 crore, whereas in the corresponding period of the previous year, the receipts in PPF amounted to Rs 14,345 crore. Experts say that while decline in interest rates was one of the reasons for the fall in fresh deposits in small savings schemes, the hike of up to 40 basis points may make them attractive once again. However, investors should look at schemes that also have tax benefit. “It may be noted that the repo rate has increased by 50 basis points in the last two revision cycles, whereas the interest rates on small savings have increased only by 40 basis points. Investors may find that in some cases, their returns from fixed-income instruments and small savings may not be enough to beat inflation. It’s advisable to invest in tax-efficient instruments such as PPF and SSS because your returns are tax-free and, therefore, your absolute returns are higher in comparison to returns from other schemes,” Adhil Shetty, CEO, BankBazaar.com, said.